Here I sign copies of “my back pages,” beside current Jazz Gallery manager Mark Lawson (left) who apparently still hasn’t turned in one of his blue books. 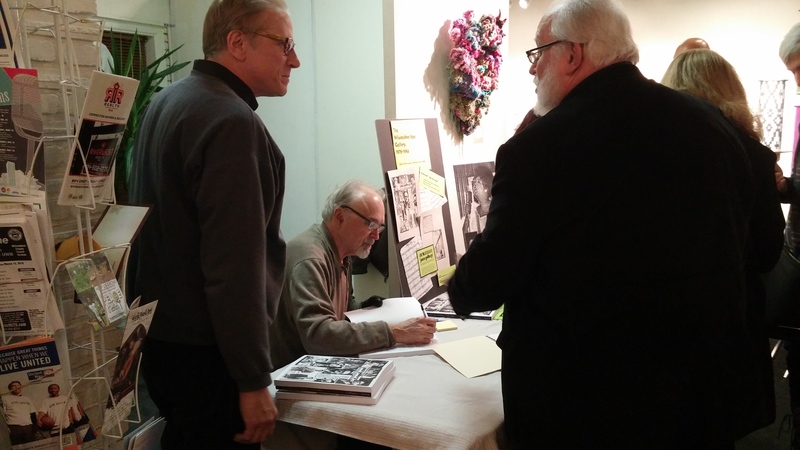 See Mark sheepishly reporting to his old English professor amid the congenial crowd at the concert and book-signing for the newly-revised anthology “Milwaukee Jazz Gallery 1978-1984.” Photo: Ann Peterson. Some of my best memories of an extraordinary place rekindled Friday night. The space once occupied by the now-legendary Milwaukee Jazz Gallery had a warm energy, passion and intelligence similar to the older place when I covered it for The Milwaukee Journal as documented by the book we were also celebrating: Milwaukee Jazz Gallery 1978-1984. What an honor to remember this place and know I’d played a part in getting the word out about it’s very special role in our community. So I’m grateful so many musicians and friends showed up, also because it seems this community is on the rise again. In fact, Center Street seems to be a bit of a jazz alley lately. Besides the Jazz Gallery Center for the Arts, here at 926 East, right up the street, Company Brewing continued its ambitious jazz booking Friday with New York-based trumpeter John Raymond and his trio. Then there’s the newly-revived Jazz Estate on Murray St. across the nearby Milwaukee River. Competition, of course, is quintessentially American, but so is jazz. 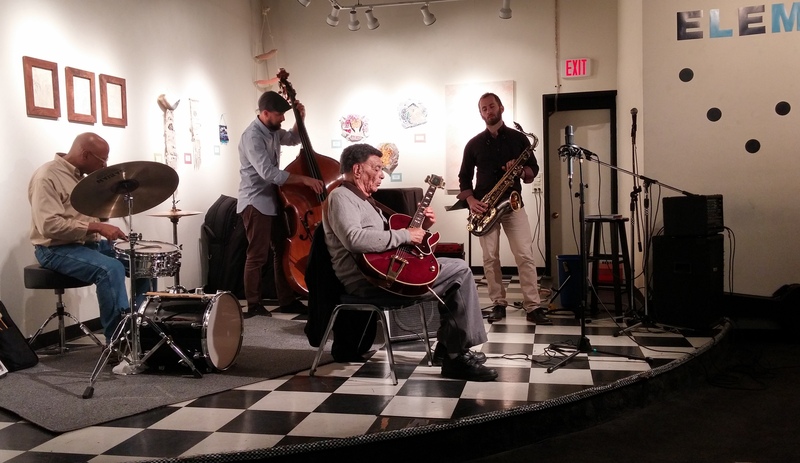 The current incarnation of the Jazz Gallery as a center for the arts always leaves it a step behind, like the Packer defensive backfield, given that, unlike the other two nearby jazz venues, it lacks a bar, the traditional financial backbone of such places. As an all-volunteer-run nonprofit entity, it needs all the help we can give it and, one hopes sooner than later, a genuine jazz angel or two. So it’s always extra-special when people show up there, and you know that it’s for the music. Only this time it was also for appreciating the history of the original Gallery and being able to relive it, in effect, by perusing the many articles and reviews written (under deadline) and documented in the anthology I humbly signed my name to. Yep, as a pre-emptive reminder, all of those reviews got filed either in a late-evening scurry by Milwaukee Sentinel reviewers (like Jim Higgins or Rich Mangelsdorff, sometimes by phone), or into the early morning hours, for Milwaukee Journal reviewers, like Bill Milkowski or myself, writing for the afternoon deadline. Yet, I was always writing in something of a jazz buzz, and yes, I was so much younger then so, even at say, two-thirty, it never made me too hurty. But last night, I felt younger than that now, thanks to the music, the memories, and the spirit. To me, as classic a form as it now is, jazz is always a youthful music, perpetually running in the moment. I’ve rarely had more stimulus for writing is a journalist as I did those years covering the Jazz Gallery, with its quiet fire and extraordinary mix of local, regional and national artists, under the watchful, pipe smoke-filled eye of club owner and visionary hipster Chuck LaPaglia. BTW, I don’t gave a damn about too many Dylan allusions, just as Dylan wouldn’t. (Bad jokes? Well, it’s my blog!) I know this dedicated acoustic space is just the sort of Greenwich Village place that the artist formerly known as Zimmerman haunted as he recounted in his autobiographical book Chronicles Vol. 1. Jazz, folk, rock, blues, it’s all part of the American mosaic to me, and guys like Dylan love the whole glorious pattern (for proof, listen to his radio show, if it’s still on). Friday night reflected a replenished musical spirit, although the scheduled artist with maybe the biggest national renown ended up calling in sick. It’s no knock on sidelined bassist Billy Johnson, but it was really somethin’ – to see octogenarian guitarist Manty Ellis playing right on time, like a grandfather-clock pendulum that never stops swinging in its own sweet, eccentric way. And drummer Victor Campbell plays like all those clock parts exploding into the Twilight Zone, so somehow it all fits together. Milwaukee’s pre-eminent drive-time jazz disk jockey on 88.9 WYMS, before it was “88.9,” during the Gallery glory years. And thanks to musicians like Mark Davis, Frank Stemper, Steve Tilton, Rick Ollman and guitar-god-in-his-p-j’s John Kurzawa, who might just need to stick to golf. But most of all, thanks to Mark Lawson and Elizabeth Vogt of the Jazz Gallery Center for the Arts and everyone in the Riverwest Artists Association for putting on this event. Because Manty Ellis is so impeccably reliable, the jewels-under-the-lumpy-rug surprise for me was tenor saxophonist Eric Schoor, even though I’ve heard him a number of times. He’s one of those brilliant young musicians who seem capable of anything his fingers might conjure. In this case, it was the ghost of Stan Getz, especially, as you might imagine, on the ballads. There, beyond your closed eyes, that limpid, pearly tone lapped softly, dissolving over the melody like a burble of sea brine. Here, my memory-peddling prompts me to indulge (again, cuz it’s my blog) in a poem that I wrote for Stan Getz years ago, and leave my thank yous at that, because I’ll have only apologies left after this. 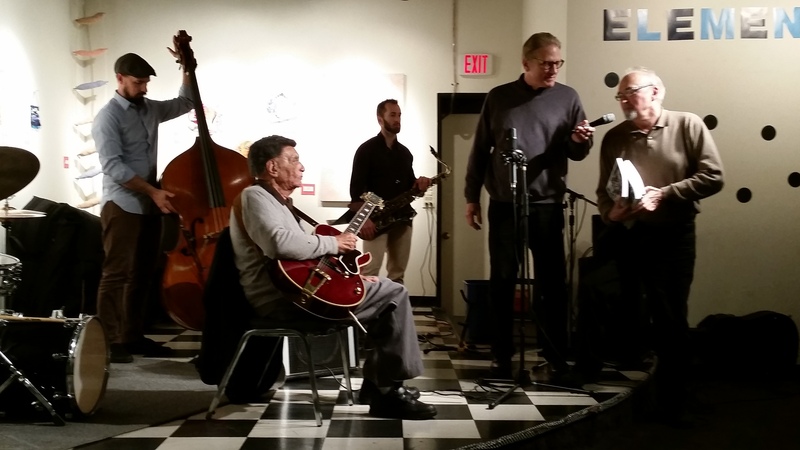 Some will recall, or read in the anthology, that Getz also played the storied Jazz Gallery, though the venue was the Performing Arts Center on the night in question. sweats out a melody, red-faced. can you carry my horn?” he croaks. The sax sings light blue. the girl deep in knee socks comes walking. But it ain’t so much an elder appraising sweet youth. Or it’s that too, with a clear trace of chagrin. “I’m beat,” his cigarette breath bellows softly. “Just go slow. Hey can you find a doctor? Is there a doctor in the river? in a big, green, long-and-cold halllll. Stan wonders about Mader’s, do I know? His belly rumbles like southern volcanos. in her hair, in her long and lust-erous hair . to the old scratchy side that goes, Ahhh. on a tide-swept beach full of guys.